It’s two weeks now that mamma Luisa is hospitalized in Bolzano, soon I’ll explain more, but although I tried hard to get hold of relatives and friends, answer all phone calls and messages, I was really upset when our family doctor called and said he was trying the get hold of me for more than 10 days without any result! This is why I write this post and I’ll update it whenever changes with mamma occur. First of all I’d like to thank all the people that supported me/us so much through the last difficult two weeks – without you we couldn’t have managed all this. I told my papa he had to do his, up there, as we need mamma much more here than he does up there! The Hardest Walk Is Walking Alone. But It’s Also The Strongest. As already the evening before my mum had complaint about a heavy headache, I immediately called the ambulance when I found her almost unconscious lying in her bed the morning of April, 12th. The emergency doctor send her to the hospital in Brunico with suspicion of a stroke, but once they got the CAT back there, they saw she suffered from a cerebral aneurysm and so they transfered her immediately to the clinic in Bolzano for surgery. This bleeding wouldn’t have been of such big harm, but on mamma’s very last meters on her way to the OR the second, disastrous bleeding occured and mamma passed out. The surgery was successful, the aneurysm got clipped, and doctors put her in artificial coma. The bleedings caused high pressure in mamma’s brain that the doctors had to open her skull in order to provide more space for the suffering brain; unfortunately this first craniectomy didn’t bring any relief so that the day after the doctors had to do a second one to open her skull even more. 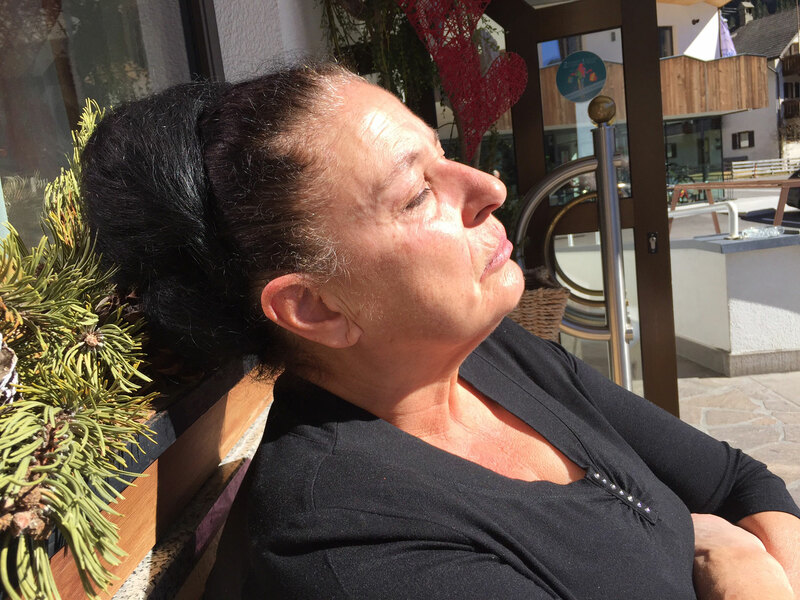 The following days the odds were against mamma Luisa – the brain pressure was dangerously high, the risk of her getting a vasospasm, a constriction of the brain tissue, was imminent. And when on Easter Monday a lung infection worsened her condition, the doctors anticipated the worst. I arrived to the hospital in the late afternoon when the doctors immediately called me into a conference rooms. “Perfect”, I told myself and was scared to hell, but all turned out to be very differently. The doctors seems to be happy themselves that they finally, after mamma having been one week in coma and intensive care, could tell me something positive: almost over night mamma’s brain pressure turned normal and she was responding well on the treatment of her lung infection! Mamma had made her first step back into life! With the normalisation of the brain pressure, the doctors started immediately with reducing mamma’s sedation. Unfortunately she didn’t react as expected and didn’t wake up since then although she had to, and like this she missed her 66th birthday on April 24th! Mamma Luisa’s breathing tube got removed and she got a temporary tracheostoma. Surgery went well, but the additional sedation for sure took its toll that she for sure wouldn’t wake up that day. We just keep on waiting for you, mum, right? Anyways, there are no changes with mamma Luisa, beside some additional complications as the long lying in bed without moving caused a thrombosis in her leg which doctors try to cure. For the rest she is still sleeping and does not really react to any tests doctors carry out. When we arrived to visit Mama at the intensive care today in the late afternoon, we found her fast asleep and maybe she was even a little bit, too 😉 ! To our big surpise not only her drainage tube had been removed from her head, but also her respiration machine was turned off as she was breathing autonomously already for hours! Mama is now stable for a few days, she sometimes opens her eyes for a moment and her feet move a bit, but unfortunately she is still not showing any reaction. Today it’s 4 weeks that Mamma Luisa is staying at the intensive care unit of the hospital in Bolzano, but if everything works out right, she should be transferred to the hospital of Brunico close by. 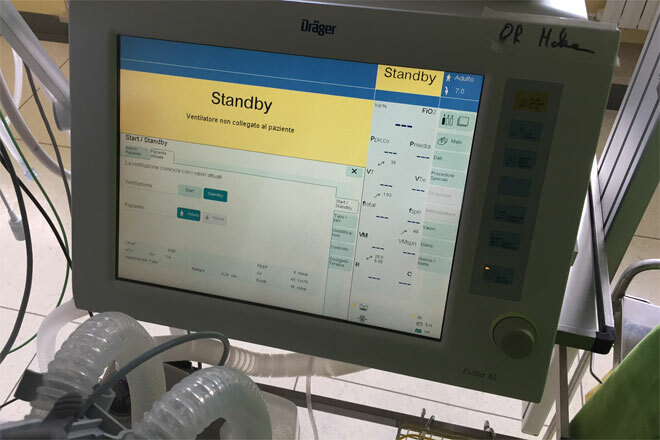 She is breathing autonomously for two days now, and she managed to stay stable throughout the entire past week, despite the thrombosis causing a peripheral pulmonary embolism, both treated successfully. Mamma is still not conscious yet, she continues opening her eyes more and more often, but doesn’t respond if you talk to her. Mum might be far behind with her progress, but to us, every single look, every new small movement are a success. And although the doctors’ reports are always sober and prognosis is difficult, my doctor-cousin’s smile couldn’t hide something encouraging must’ve happened. He came up to my mum, squeezed her foot and she immediately pulled her leg back – it was her first real reaction! This for sure was just a small step, but we were simply blown away – Mum keeps fighting! Throughout the last days Mamma Luisa was able to breath autonomously and like this, she finally made it out of the intensive care unit! Now on the neuro care unit, she’ll stay under observation for the next days. Her condition hasn’t changed significantly, but she keeps staying stable. Actually the last 10 days Mamma Luisa managed to stay stable, and during my long stays next to her bed I could realize all the small, small steps forward she made each day – she was able to keep her eyes open longen each day, started to focalize and to follow movements and to slightly squeeze my hand when I asked her to, and I am sure she started to recognize the people coming to visit her. But since yesterday everything’s changed. Among other things, another lung infection made her breathing so hard that she had to be brought back to the intensive care unit. Her condition is critical; let’s hope her body will be strong enough to fight these complications once again! Spring is around the corner! The Boss is back!